Things were getting pretty stale around here, and I let the place go a bit. A refresh was in order, so that's what I did. Have a look around. A few fun posters to commemorate the USMNT's World Cup Group Stage matches and our shindigs at the brewery (for the first two matches at least, new floors are sending us elsewhere for game 3). La Poste is an amazing French-leaning restaurant in the Gaslight District of Clifton in Cincinnati. When they brought über talented Andrew Mersmann on-board as their new executive chef, Andrew tasked me with bringing La Poste's website up to modern web standards. In addition to the web design, we shot some new photography of their beautiful food and streamlined La Poste's overall brand. Go now, and order the Wild Mushroom Ravioli. As a member of the Queen City Project, I was honored to play a part in the documentation of CoSign 2013, editing the video you see above (with imagery provided by Alias Imaging and Bluestone Creative). CoSign, in it's second year, is a non-profit program that connects independent business-owners, designers, and fabricators to create a one-of-a-kind signage. The designers and fabricators are compensated for their work, the business receives a free-of-charge sign, and a neighborhood receives a transformative facelift. Everybody wins. Very exciting day here in Ohio, as we've launched the new responsive version of ElevenWarriors.com. I am very proud to have worked with the very talented Lindha on the front-end design portion of the project, and am amazed by the development talents of 11W's leader, Jason Priestas, and the CSS wizardry of Brian Toombs. This site is a monster, and we're very proud of it, so go poke around. Our awesome friends Chrissa and Sam recently got married on the Williamsburg Waterfront in Brooklyn, and I was honored to have the opportunity to design their wedding invitations. The lovely couple wanted the invitations to reflect the view from the ceremony/reception's venue, and who could blame them. For the event, I created color coordinated invitations and rsvp cards for the wedding (green) and the rehearsal dinner/toasts the night before (pink). As the bride is from Seattle, they are also having a West Coast celebration, and I added a matching set of Seattle themed Pink Invitations. The wedding was a blast, and I was honored to play some small roll in making it happen. I've been sitting on this for a little while, but now that it's starting to roll-out, I'm excited to share it with the world. Working with the gang at Eleven Warriors —leading up to the launch of 11W 2.0 (soon)— we've refreshed the site's brand to better reflect the spirit and ethic of the organization. The seal logo here includes the site's new latin motto, "Aesculus Excellantiam," which translates to "Buckeye Excellence." Lot's more to come from the 11W front in the coming weeks. Our goal is to create experiences that support the common wealth of the community through love for food. It is a place where food is locally-sourced and inspired by our region’s past, prepared with passion and creativity, and served with Kentucky hospitality. It is a place to share stories and a meal. It is, in short, the perfect neighborhood eatery. In planning their eatery, Chris and Tess reached out to me to develop Commonwealth's brand and visual language. I designed a logo and ID for the restaurant, contributed photography and designed and developed a new responsive website that is built to grow with the restaurant as opening night approaches. Last week, we launched a new site for Land-Grant on the back of some big news. The brewery now has an official location. We thought it would only be appropriate to complement that new physical address with a virtual one. 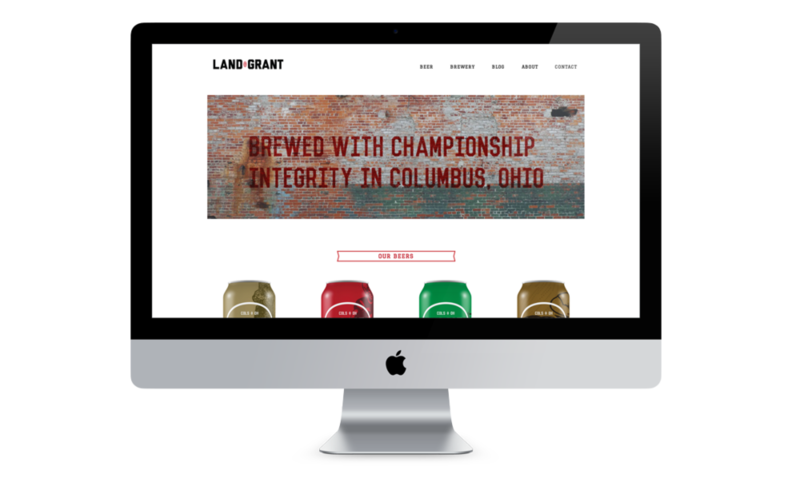 Landgrantbrewing.com is now live in all of it's responsive glory. There you can find info on the beer, the brewery-to-be, and a blog documenting the whole process. I'm a huge fan of tacos, braised meat, guacamole and pretty much everything else that comes along with Mexican inspired food. So when Django Western Taco asked me to design and build their website, it was a no-brainer. Then when they had me come in and photograph (and sample) their killer Tex-Mex, it only sweetened (spiced?) the deal. We developed a simple one-page responsive site that puts the imagery and info up front. Next time you're in Northside, I highly recommend the Sheriff's Stone Bowl.